An eye-catching display of dazzling violet stars. Produces globes of dazzling violet stars. Perfect for pots and borders. Returns year after year, ideal for naturalising. Supplied as a pack of 50 bulbs. 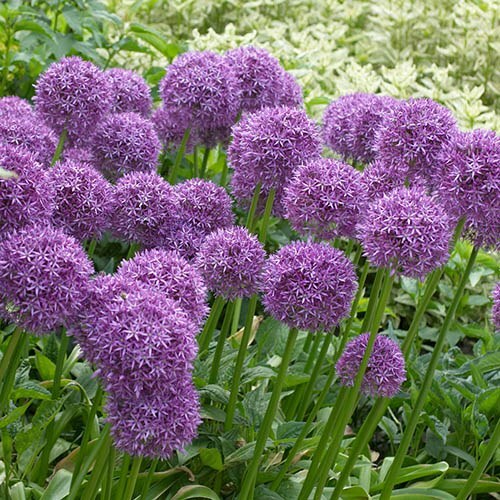 A terrific, award-winning variety of Allium which will flower year after year with globes of eye-catching violet! Allium 'Violet Beauty' produces round heads of dazzling violet stars which mix easily with other shades of blue and purple in the garden. The large, rich purple blooms can reach around 10cm in diameter, and unlike many alliums, have a subtle, sweet fragrance. Perfect for patio pots or planted in drifts in borders, they’ll provide real spring delight! What’s more, the flowers are loved by bees and butterflies so are perfect if you’re looking to bring wildlife into your garden or help to encourage pollination. The blooms are long lasting and the seed heads that follow are equally lovely. Both are superb in floral arrangements and with so many bulbs included here, you will have a good supply for cut blooms AND garden decoration! Holder of an RHS award of garden merit, you're sure off success, and they're totally winter hardy too, so once planted they will naturalise and produce a stunning display each year! Supplied as a pack of 50 bulbs, ready for planting now. Mix in with herbaceous perennials which will mask the foliage which dies down before the flowers appear. Allow foliage to die back naturally. Lift and divide in the autumn.